Got questions for the governor? Join WTOP at 10 a.m. on Tuesday for "Ask the Governor," our monthly call-in show. Feel free to leave your questions here or Tweet them to #Askthe and we'll ask the governor during the show. You can listen live on the WTOP website. We are on air with Gov. Bob McDonnell. Are you tuning in? On Creigh Deeds, Gov. McDonnell says he has some budget recommendations regarding mental health emergencies and bed space. "He was a fine man, a great public servant," McDonnell says of Creigh Deeds. McDonnell says he will look at broader mental health system issues regarding bed space at mental health facilities. He says he wants to look at if the four-hour time for detention needs to be extended to six or eight hours. “Some action is needed and we will take some decisive action in the coming weeks,” McDonnell says of adding bed space at mental health facilities in the commonwealth. Gov. McDonnell says facts are still being gathered about how Creigh Deeds' son, Gus, got a gun. On topic of weapons for those who may have mental illness, McDonnell says denying people of their right to own a firearm on the basis of less than a court order is "on the wrong side of the civil liberties equation." No trend in Democratic leaders in Virginia, McDonnell says. McDonnell says the Republican party has not lost its voice in Virginia. In the last 12 years of the gubernatorial race, there have been six Democrats in office and six Republicans in office, he adds. You can't create any mega trends with this year's races and Democratic wins, McDonnell says. 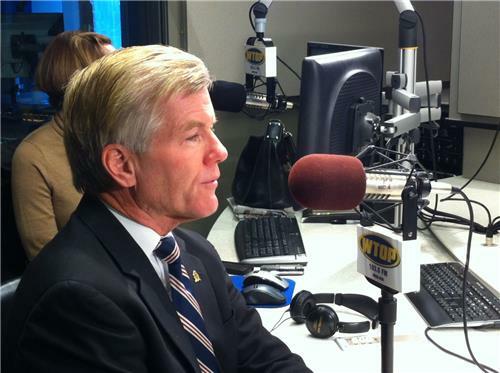 On the AG race, McDonnell says it is premature to contest the election. To do that, would have to prove there was some sort of inaccuracy in the election and that it wasn't conducted fairly.